As a food blogger you are in a magical world of recipes, yes I too want to explore Rhubarb in my Kitchen. Whenever I see Rhubarb strawberry pie, crumb bars, cake and muffins my heart tell me go ahead and try something. Finally one day I spotted Rhubarb in my local Kroger store at price of almost gold, I decide to buy. My hubby who is not usually adventurous into unknown area was not happy. I told him I want to buy some. He agreed if I get only 2 stalks which I did and finally made Rhubarb Achar/ Indian style Rhubarb Pickle. After a head spinning attempt to make a dessert with it I decided to make crumb bars but before pre-heating to oven I decided to wash and cut the Rhubarb. That is the wise thing I did. After cutting I tasted a slice. It has a tart taste and if I am combining with strawberries as I thought previously I need a good amount to sugar to make a dessert. Skipped that idea, then I decided to make the Indian style Rhubarb pickle. It is mainly spicy with background of slight sweetness from the jaggery I decide to make it. This is South Indian style made with gingerly oil, mustard seeds, fenugreek seeds asafetodia, salt, jaggery, red chili powder, green chili, curry leaves, garlic cloves and of course the star Rhubarb. Indian friends I searched over the net whether Rhubarb is grown in India, I couldn’t find anything. If you find it in the market try to make this Achar. 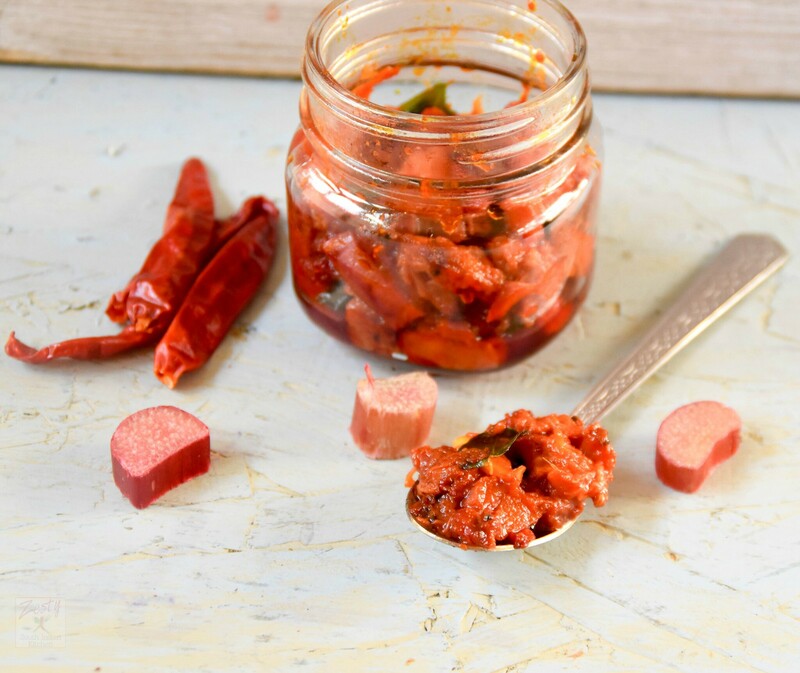 If you are little spicy enthusiastic then you will love this recipe, it goes as spicy relish. It is good with bowl of rice, bread or chapathi you name it. You may be thinking did I forget the idea of dessert with Rhubarb. No still lingering in my mind, I will make it next time I buy them. 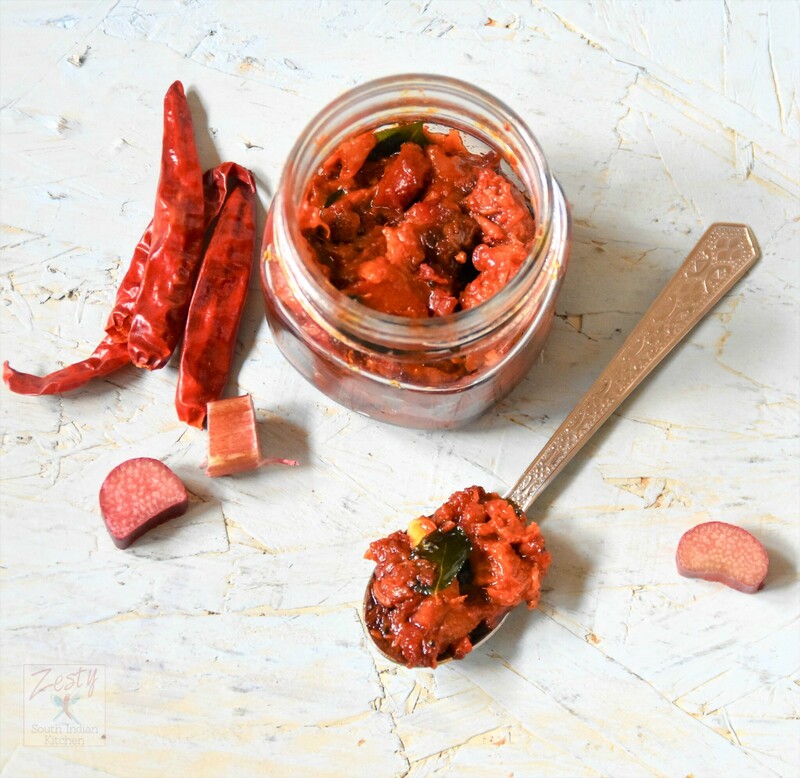 Spicy South Indian Style Rhubarb Pickle goes well with bowl of rice or chapati. Heat 2 tablespoon oil in a pan and add mustard seeds when it starts popping add fenugreek seeds, curry leaves and asafoetida. Once Rhubarb is soft, then switch off the flame. Thanks I too made it for first time. I too making it for first time. I’ve never had rhubarb in a savory setting like this but I love the idea and sound of this pickle. Sounds so good! Thanks it is spicy, tangy, light sweetness in the background. Being from the south, I had never heard of rhubarb until I met my husband. He was talking all about rhubarb pies from growing up (he grew up, up north). We actually had a local grocery store order some and he made a crumble with it. Loved it! I did taste it raw and didn’t care for it at all. From all the stories I’ve heard of rhubarb, I’ve never seen it in savory recipes. I must admit I’ve never had rubarb achar before. So intrigued. Love the pickle masala so I know it’s definitely going to taste awesome. I’ve only had and seen sweet rhubarb recipes before so it really is a nice change to see a savory rhubarb recipe like this one! Swathi, savory rhubarb goes beautifully with meats. I don’t know if you eat pork, but I can imagine having your lovely pickle with a sausage or slice of ham. Or with samosas. Or … now you’ve got my imagination going! This recipe sounds wonderful (though I would have to skip the garlic – allergic). I made a rhubarb dessert this week and purposely made it with even less sugar than I listed in the recipe — my husband and I like tart things. I won’t pork my hubby eat it. I need to check your Rhubarb crumble now. I love Rhubarb!! This is a new way to fix it … for me. I’m thinking this would be wonderfully crunchy and certainly tangy! I have never had rhubarb in a savoury dish. This would be unique, and I can see me using it on a cheese platter. Would be perfect for entertaining. 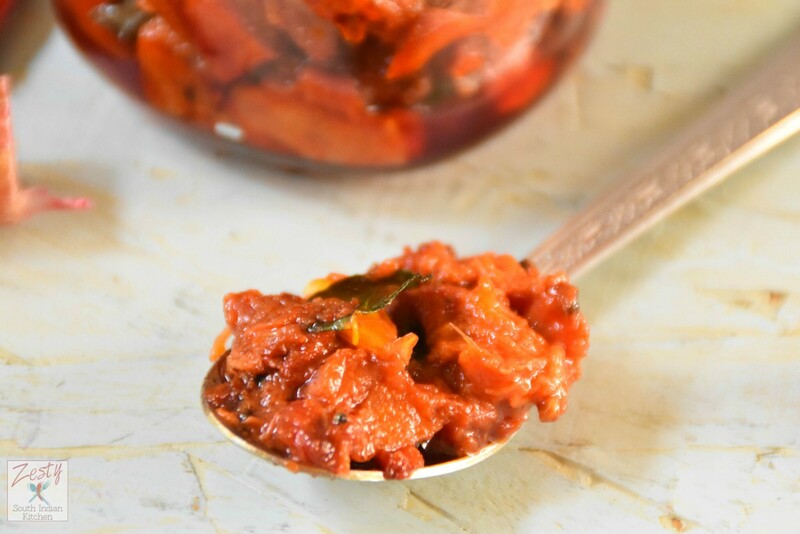 I love spicy food so having this rhubarb pickle would be a wonderful addition! Thanks for the recipe! I’m looking forward to trying rhubarb for a savory dish. I’ve only ever used it in a pie, but this sounds delicious. Thanks for sharing! I’m looking forward to trying rhubarb for a savory dish. 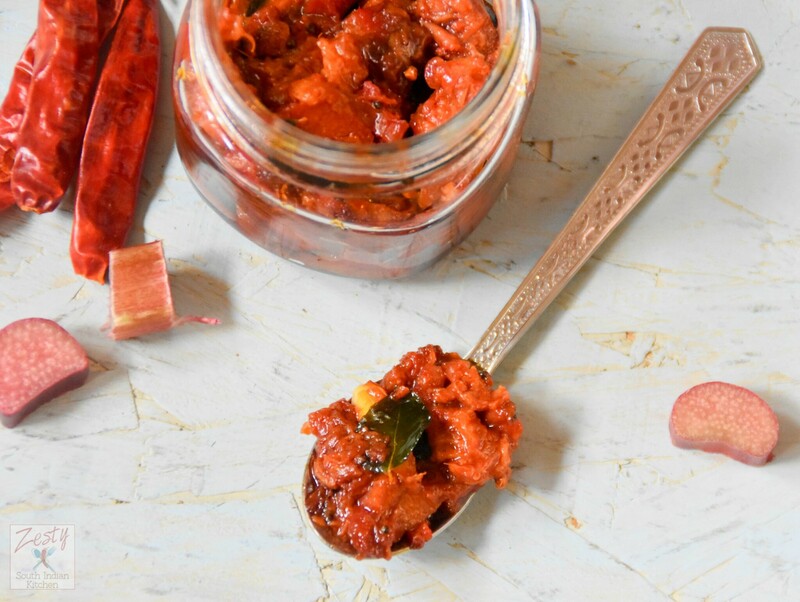 This rhubarb achar sounds delicious. Thanks for sharing! These sound great! Glad your husband let you take the plunge down the rhubarb trail. I like that you have used them in a savory dish here. Other than their red color they just never sounded like a desert food to me! Wow! What a lip-smacking pickle! so tempting!